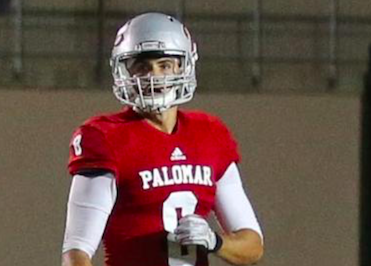 SAN MARCOS (9-25-2018) / (REVISED 9-27-2018) — The Southern California Football Association has honored Palomar quarterback Shea Morales and Comet receiver Malachi Russell as National Division Offensive Co-Players of the Week after their performances Saturday night in a near-upset road loss to Ventura, the No. 3-ranked community college team in California entering the game. The Pirates, who barely held off the Comets in a 45-38 non-conference shootout when a fourth-down 11-yard pass was incomplete in the end zone with 13 seconds to play, since have moved up to the No. 2 ranking in the state after previous second-ranked City College of San Francisco was upset by Butte on Saturday 42-21. Russell, a 6-foot-0, 160-pound freshman out of El Camino High, finished the night with 10 receptions for 161 yards including two touchdowns, one from Morales for 52 yards and the other from Connor Curry for 28 yards. The Comets battled back from a 21-point deficit midway through the fourth quarter. Palomar is in its first season in the SCFA’s Central League after previously playing in the Southern League. Ventura plays in the Northern League. The Central, Southern and Northern leagues make up the upper tier, state playoff-eligible National Division. The other three leagues in Southern California are members of the second-tier American Division, in which teams are ineligible to be selected for the state playoffs. The Northern California Football Association has a similar playoff-eligible National Division, non-playoff eligible American Division structure.